Flip a coin. If tails, Paralysis the foe. 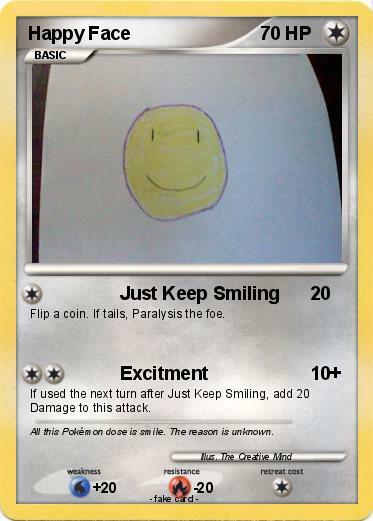 If used the next turn after Just Keep Smiling, add 20 Damage to this attack. Comments : All this Pokémon dose is smile. The reason is unknown. happy cat | Happy face | Happy face | derp face | Happy kitten | Happy kid! | happy flower | Happy | Happy turtle : ) | Happy Face | happyn | Happy face | Happy face | HAPPY FACE | happy face | Happy Face | Happy Face | Happy Face | Ultra Smiley Face | Troll Face | Double Happy | Up Face Swap | White Smiling Face | The ugly face | smiley face | mr.happy face | epic face! | Da face | I hate u | WOW FACE!!!! | happy face | lol face | sad face | Big smile | Happy Cat | Very Happy Android Face | my face | Happy Face | mandy | Epic Face | Happy Face | mew | happy face | happy face | Happy face | Happy Face | LOL FACE | Happy face | epic face | Grumpy Cat | Happy Face | Doge | The Minecrafter | Smiley Face | Happy face | Smily | Spongebob | Timothy | Banana | Happy Face | Fat Hot Dog | happy face | smiley face! | Funny Cat | happy face | happy face | red | catman | Happy Face | ALL FOR ME?? ?